PlasautoΣ™ is a multi-functional device for therapeutic apheresis and continuous renal-replacement therapeutic treatments. It realizes three Σ™ features: speedy, safety i smart. Plasauto Sigma - Modern cassette system with dreins and multiprocessor allowing the performance of highly-specific therapeutic treatments. Created in order to meet the needs of the next generations, PlasautoΣ™ allows carrying out highly reliable purification of blood. Unique Solution - Resistant to external shocks - minimised risk of decalibration. Speedy - drein preparation time is minimised thanks to the cassette system with dreins and pumps with stator. Thanks to the self-filling function, PlasautoΣ™ reduces time needed for the first filling in other devices. Safety - unique technology of fluid disposal control assures carrying out the treatment with high precision. 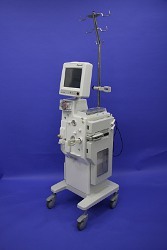 Smart - PlasautoΣ™ is a multi-functional device for carrying out apheresis and CRRT in different combinations. The system offers many automatic control functions including the automatic plasma exchange and the automatic control over the pressure-dependent flow.